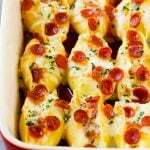 These pizza stuffed shells are pasta shells filled with three kinds of cheese and pepperoni, then baked to perfection in tomato sauce. An easy make ahead dinner that the kids will love! 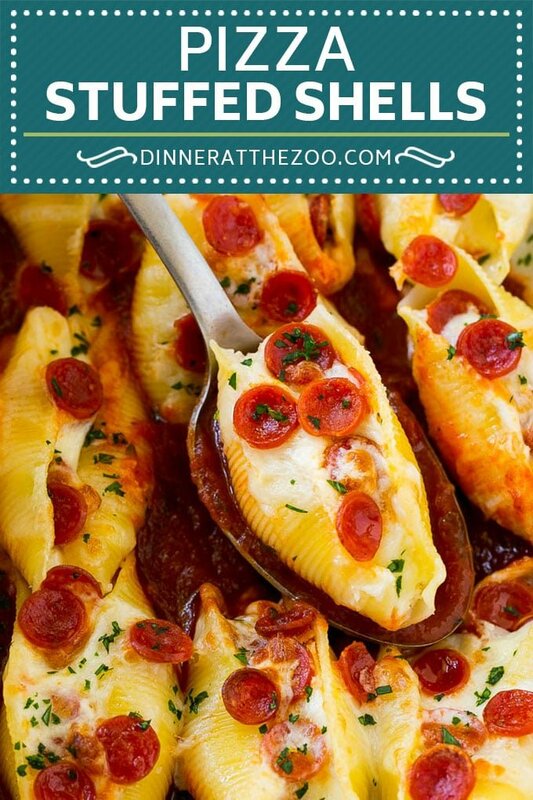 This fun and unique stuffed shells dish combines pizza and pasta for a hearty dinner option that’s family friendly and totally delicious. Serve your pasta shells with some garlic knots or a roasted veggie for a complete meal. I am a huge fan of mixing two recipes together and turning them into one even more amazing recipe. These pizza stuffed shells are no disappointment and turned out even better than I imagined. They were a huge hit at the dinner table and I’m ready to make them again. HOW DO YOU MAKE PIZZA STUFFED SHELLS? Imagine all the best parts of pizza, stuffed inside pasta shells and baked to perfection. 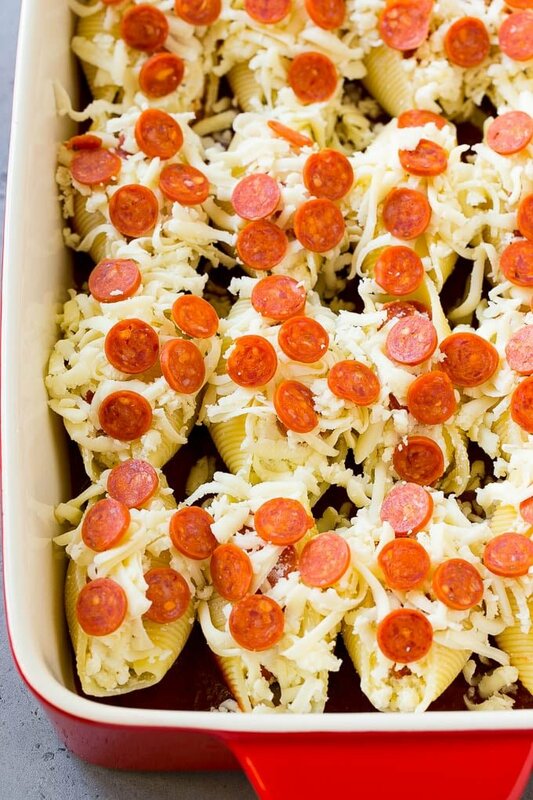 That’s exactly what these pizza stuffed shells are. 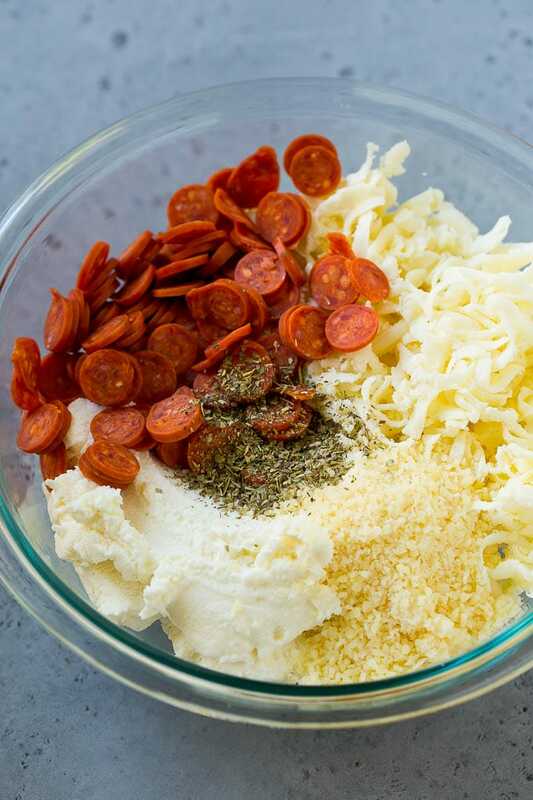 The first step is to make the filling, which is a combination of ricotta, mozzarella and parmesan cheeses, along with mini pepperoni and seasonings. I kept it simple with just pepperoni and cheese, but you can also add other pizza toppings like cooked sausage, olives, peppers, and mushrooms. The best part about this recipe is that it’s easily adjusted to match your pizza craving preferences. You can either use pizza sauce or marinara sauce to line the bottom of your baking dish; whichever you prefer. To make pizza stuffed shells ahead of time, simply stuff the shells and place them in the tomato sauce, then cover and refrigerate for up to 8 hours. Uncover, add the remaining toppings, then bake when you’re ready to eat. You’ll need to add more time in the oven if you’re starting with a cold dish of shells. DO THE PASTA SHELLS NEED TO BE BOILED FIRST BEFORE BAKING? Your pasta shells should be prepared based on package directions prior to the baking phase. If not, you will end up with some mighty tough shells to bite through. Be sure you follow the instructions as different brands cook for different lengths of time. CAN THE PASTA SHELLS BE STORED IN THE FRIDGE? If your shells haven’t been cooked, there’s no reason to store them in the fridge. However, if you have unstuffed, cooked pasta shells, these can be stored in a properly sealed dish for up to 3- 5 days. I suggest only doing this if necessary. Pasta is one of my family’s favorite ingredients and of course, pizza is always a hit. My kids like to keep things basic, but these shells can be stuffed with a variety of fun ingredients. However you decide to make them, you will definitely enjoy them. 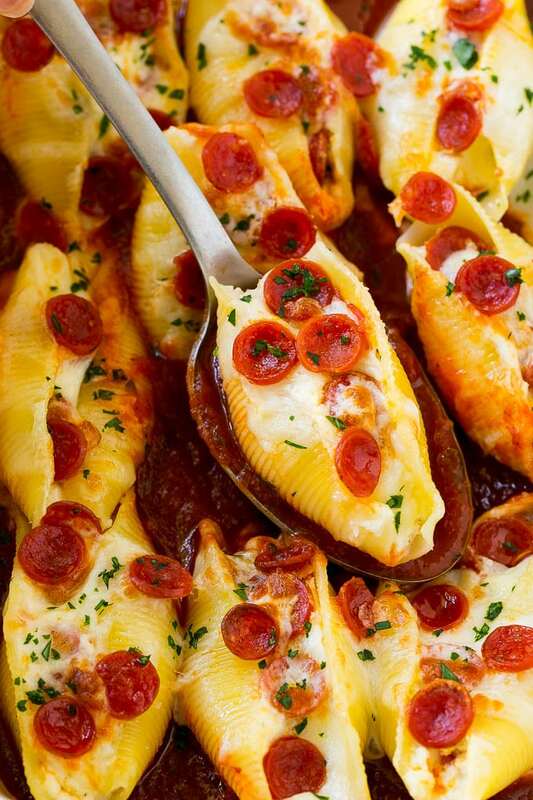 These pizza stuffed shells are pasta shells filled with three kinds of cheese and pepperoni, then baked to perfection in tomato sauce. Preheat the oven to 375 degrees F. Coat a 9"x13" baking pan with cooking spray. Spread the pizza sauce in an even layer in the bottom of the pan. Place 1/2 the pepperoni, the ricotta cheese, 1/2 the mozzarella cheese, Italian seasoning, salt and pepper and parmesan cheese in a large bowl. Stir to combine. Fill each shell with the ricotta mixture and place in the baking dish. Sprinkle the remaining mozzarella and pepperoni over the top of the shells. Bake for 25 minutes or until cheese is melted and starting to brown. Sprinkle with parsley and serve. Make ahead instructions. Fill the shells and place in the pan on top of the layer of pizza sauce. Cover and refrigerate for up to 8 hours. Uncover and sprinkle with remaining mozzarella and pepperoni. Bake for 30-35 minutes or until pasta is heated through and cheese is melted. Made this for my birthday dinner. It was very easy to make & assemble. It actuay made the kitchen smell like a pizza cooking! We all liked it very much! Thank you for sharing this recipe. So glad to hear everyone enjoyed it, thanks for reporting back! Happy belated birthday! Are these shells precooked or a “no cook” before variety? When I’ve made stuffed shells, they are never this pretty as they are usually torn or stick together. This looks like a great recipe everyone would eat. You need to cook the pasta before you fill it, I hope you enjoy this recipe! I made this but added more pepperoni and mozzarella than what it called for. It was pretty good. I will definitely make it again. I’d just omit it and use more mozzarella, or you could use romano or fontina cheese. What type of Italian dressing do you recommend? I have only used the kind that is already mixed with oil and vinegar and am not familiar with the dry dressings. Pretty good dish. I beefed up the filling by adding sautéed onions and mushrooms. My family said it is similar to the Lasagna stuffed shells I usually make. Good dish to make when your in a hurry and I usually put the extra in a Tupperware and freeze it for another day. I’m new to the gluten free diet and just wondering other than the shells what other alterations would be necessary to make this gluten free? Nothing else in the recipe should have gluten, I would just double check to make sure whatever marinara sauce you buy is gluten free! My hubby hates ricotta cheese is there a good substitute or is it ok to leave it out? You can leave it out, but you’ll probably want to add something else like more mozzarella or pepperoni or something like cooked sausage, otherwise you won’t have enough filling for the shells. My mom uses cottage cheese when making lasagna instead of ricotta cheese. I’m trying it that way and will see how it goes. Cheesy Italian goodness! My family loves this kind of a meal! My son would love these, he loves pizza! Might make a healthier version for him over the weekend. These look super amazing! I didn’t know that I could buy pepperonis that small. I am definitely pinning to Facebook. Thanks for the recipe! OMG YUM. 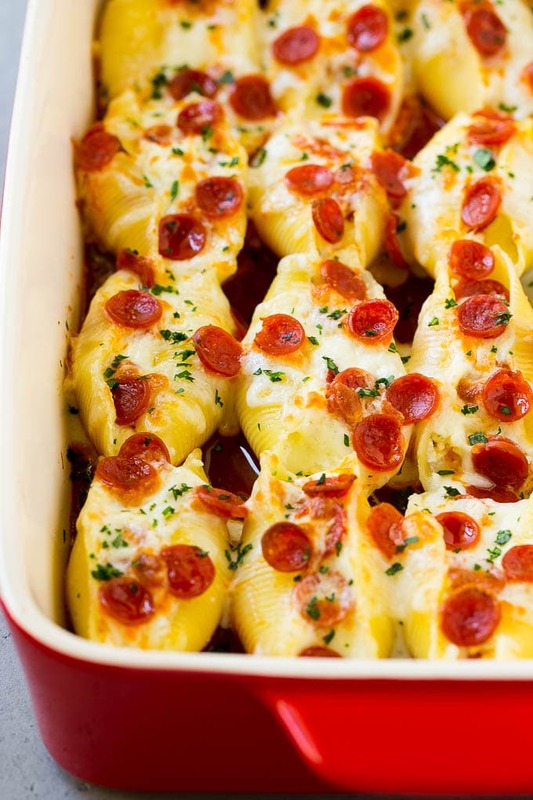 My husband and daughter would love these pizza stuffed shells!! What a unique recipe and idea! They are delicious! Thanks for the recipe and making it so simple to follow. An elegant meal for a great price. My family would love this pasta dish. We are huge fans of pasta and cheese. Oh my gosh, these look amazing! 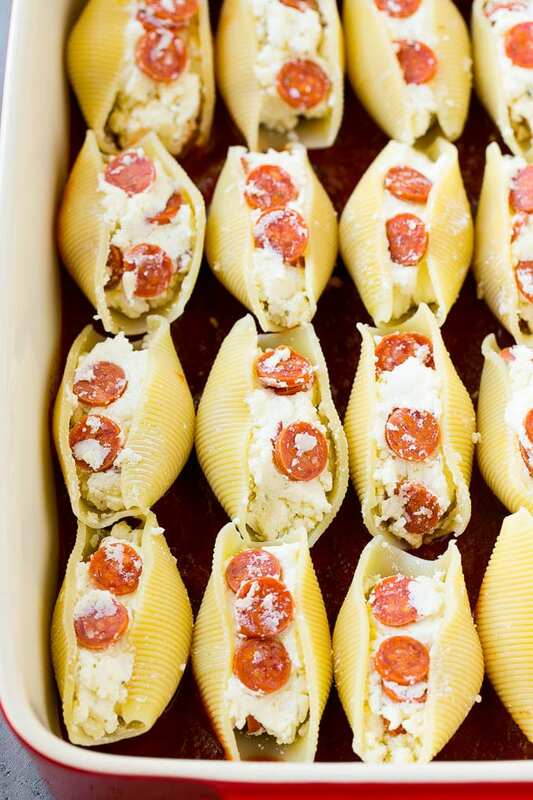 Such a fun twist on the regular old stuffed shells. I think my husband would really love them!